Martensitic stainless steels are similar to low alloy or carbon steels, having a structure similar to the ferritic steels. However, due the addition of carbon, they can be hardened and strengthened by heat treatment, in a similar way to carbon steels. 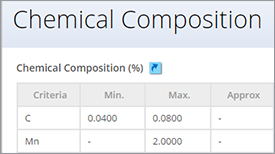 The main alloying element is chromium, typically 12 to 15%, molybdenum (0.2-1%), no nickel, except for two grades, and 0.1-1.2% carbon. Their structures are "body-centered tetragonal" (bct). and they are classed as a "hard" ferro-magnetic group. In the annealed condition, they have tensile yield strengths of about 275 MPa and so they are usually machined, cold formed, or cold worked in this condition. The strength obtained by heat treatment depends on the carbon content of the alloy. Increasing the carbon content increases the strength and hardness potential but decreases ductility and toughness. The higher carbon grades are capable of being heat treated to hardnesses of 60 HRC. Optimum corrosion resistance is attained in the heat-treated i.e. hardened and tempered condition. In comparison with the austenitic and ferritic grades of stainless steels, martensitic stainless steels are less resistant to corrosion. 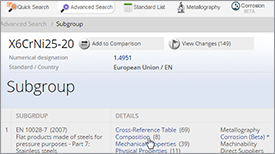 Martensitic grades of stainless steels can be developed with nitrogen and nickel additions but with lower carbon levels than the traditional grades. These steels have improved toughness, weldability and corrosion resistance. Figure 1 shows the microstructure image of a martensitic stainless steel. Figure 1: Microstructure image of a martensitic stainless steel. 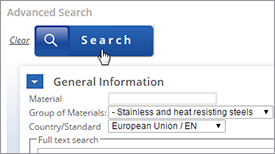 In order to obtain a useful property profile martensitic stainless steels are normally used in the hardened and tempered condition. The hardening treatment consists of heating to a high temperature in order to produce an austenitic structure with carbon in solid solution followed by quenching. The austenitizing temperature is generally in the range 925–1070°C. The effect of austenitizising temperature and time on hardness and strength varies with the composition of the steel, especially the carbon content. In general the hardness will increase with austenitizising temperature up to a maximum and then decrease. 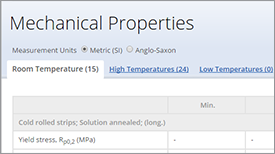 The effect of increased time at the austenitizising temperature is normally a slow reduction in hardness with increased time. 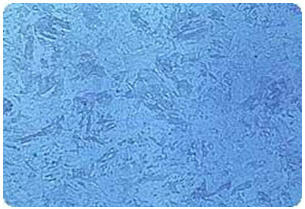 Quenching, after austenitizising, is done in air, oil or water depending on steel grade. On cooling below the MS-temperature, the starting for the martensite transformation, the austenite transforms to martensite. The MS-temperature lies in the range 300-700°C and the transformation is finished of about 150-200°C below the MS-temperature. Almost all alloying elements will lower the MS-temperature with carbon having the greatest effect. This means that in the higher alloyed martensitic grades the microstructure will contain retained austenite due to the low temperature (below ambient) needed to finish the transformation of the austenite into martensite. In the hardened condition the strength and hardness are high but the ductility and toughness are low. In order to obtain useful engineering properties, martensitic stainless steels are normally tempered. The tempering temperature used has a large influence on the final properties of the steel. The effect of tempering temperature on the mechanical properties of a martensitic stainless steel AISI 431 is shown in Figure 2. 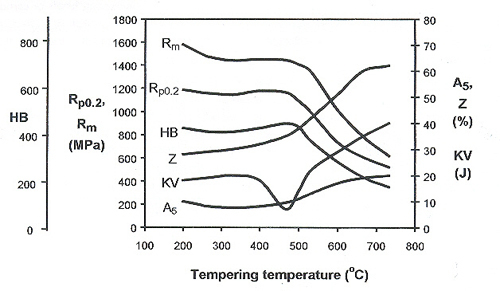 Figure 2: Effect of tempering temperature on the mechanical properties of AISI 431. Normally, increasing tempering temperatures below about 400°C will lead to a small decrease tensile strength and an increase in reduction of area while hardness, elongation and yield strength are more or less unaffected. Above this temperature there will be more or less pronounced increase in yield strength, tensile strength and hardness due to the secondary hardening peak, around 450-500°C. 410 0.15 1 0.5 11.5-13.0 - - 0.04 0.03 The basic composition. Used for cutlery, steam and gas turbine blades and buckets, bushings. 416 0.15 1.25 1 12.0-14.0 - 0.6 0.04 0.15 Addition of sulphur for machinability, used for screws, gears etc. 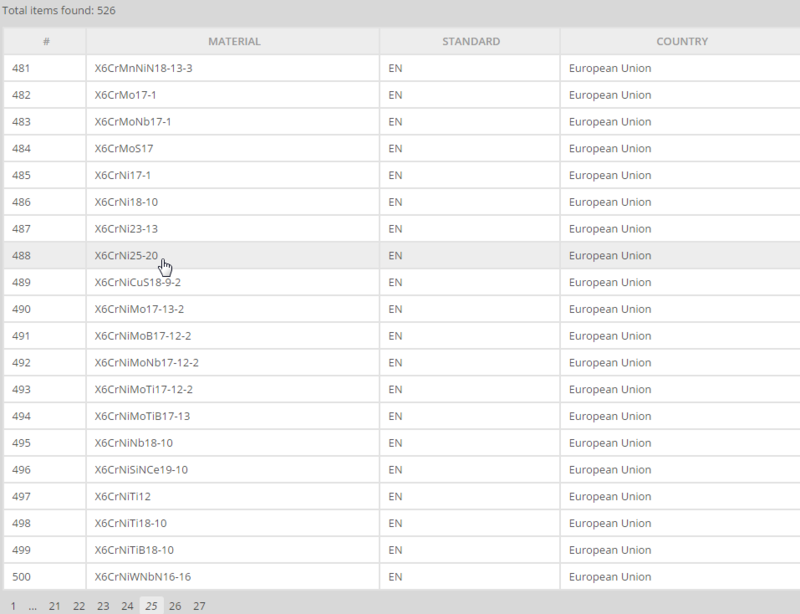 416 Se replaces suplhur by selenium. 420 0.15-0.40 1 1 12.0-14.0 - - 0.04 0.03 Dental and surgical instruments, cutlery. 431 0.2 1 1 15.0-17.0 - 1.25-2.00 0.04 0.03 Enhanced corrosion resistance, high strength. 440A 0.60-0.75 1 1 16.0-18.0 - 0.75 0.04 0.03 Ball bearings and races, gage blocks, molds and dies, cutlery. 440B 0.75-0.95 1 1 16.0-18.0 - 0.75 0.04 0.03 As 440A, higher hardness. 440C 0.95-1.20 1 1 16.0-18.0 - 0.75 0.04 0.03 As 440B, higher hardness. 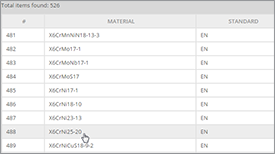 In addition to the standard grades, a large number of alloyed martensitic stainless steels have been developed for moderately high temperature applications. Most common additions include Mo, V and Nb. These lead to a complex precipitation sequence. A small amount (up to 2 wt %) of Ni is added which improves the toughness. The 12Cr-Mo-V-Nb steels are used in the power generation industry, for steam turbine blades operating at temperatures around 600°C. The effect of nitrogen on localized corrosion resistance of martensitic stainless steels showed that intergranular corrosion effectively takes place in martensitic microstructures exposed to sulphuric acid solutions, and that nitrogen additions up to 0.2 [wt-%] allow improving resistance to this kind of localized attack. 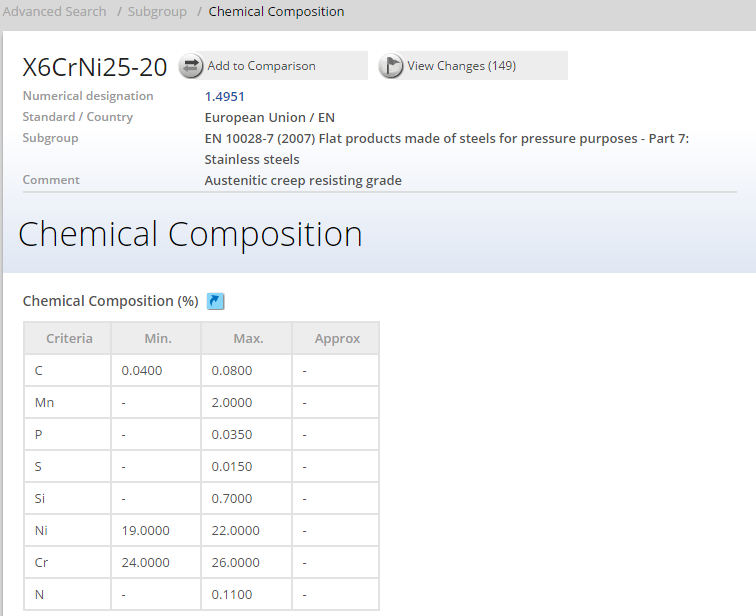 Figure 3 shows a much better corrosion resistance of high-temperature nitrided AISI 410S stainless steels which tested in acid solution containing chloride ions, in comparing with AISI 420. The superiority of the high nitrogen steel prevailed for all the tempering temperatures studied, 200, 400 and 600°C. 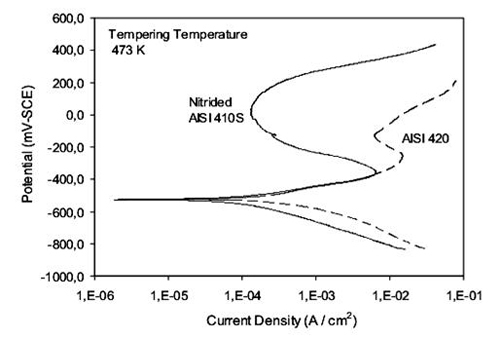 Figure 3: Comparison between polarization curves for AISI 420, and high temperature nitrided AISI 410S steels tested at 25°C, tempered at 200°C. 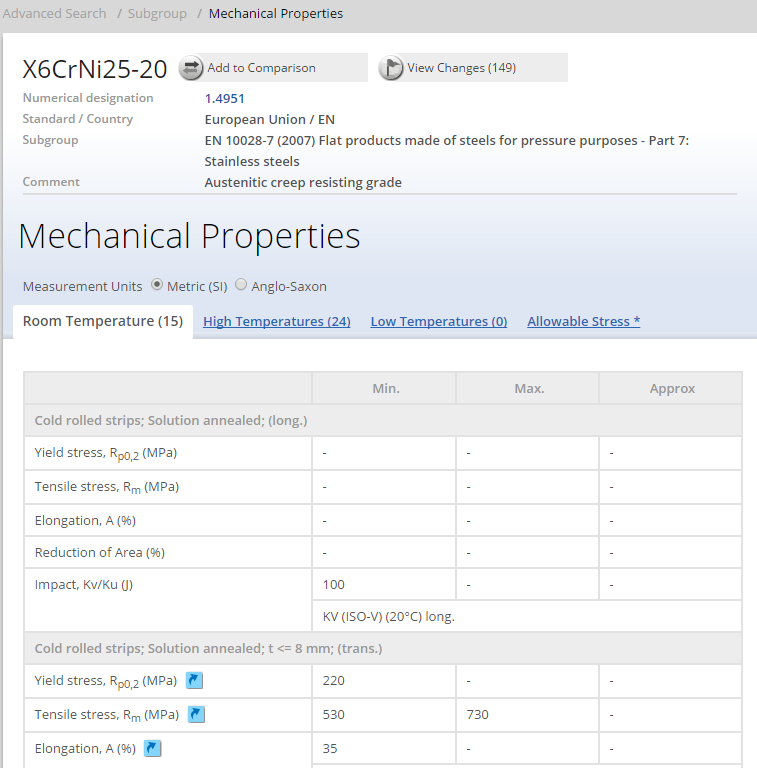 Some corrosion-erosion experiments performed with martensitic stainless steels have shown that corrosion-erosion resistance of the high-nitrogen stainless steels (AISI 410N, 410SN, is higher than that of the conventional AISI 420 stainless steel for the testing temperatures, in the range from 0°C to 70°C, which can be associated to the beneficial effect of nitrogen in solid solution in martensite. As mentioned above, the martensitic stainless steel have the highest strength but also the lowest corrosion resistance of the stainless steels. They are also easily welded. Due to their high strength in combination with some corrosion resistance, martensitic steels are suitable for applications where the material is subjected to both corrosion and wear. Martensitic steels with high carbon content are often used for tool steels. Typical applications are: aerospace, automotive, hydroelectric engines, cutlery, defense, power hand tools, pump parts, valve seats, chisels, bushings, ball bearings, sporting equipment industry, surgical instruments etc. 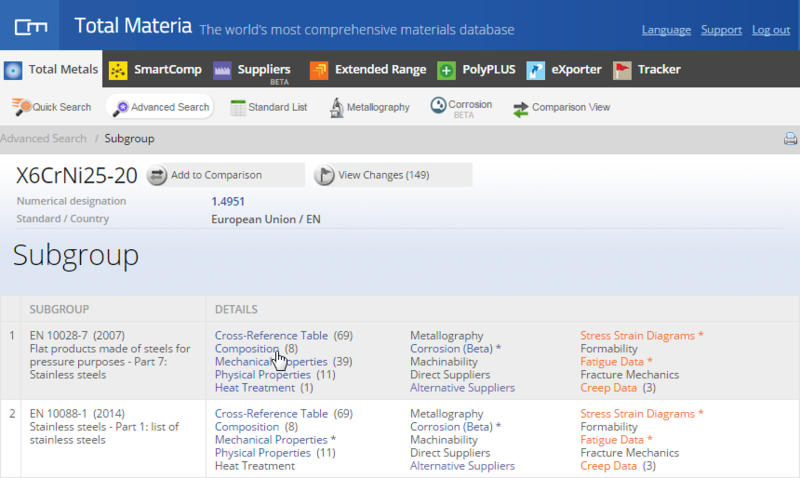 The Total Materia database contains many thousands of stainless steel materials across a large range of countries and standards. 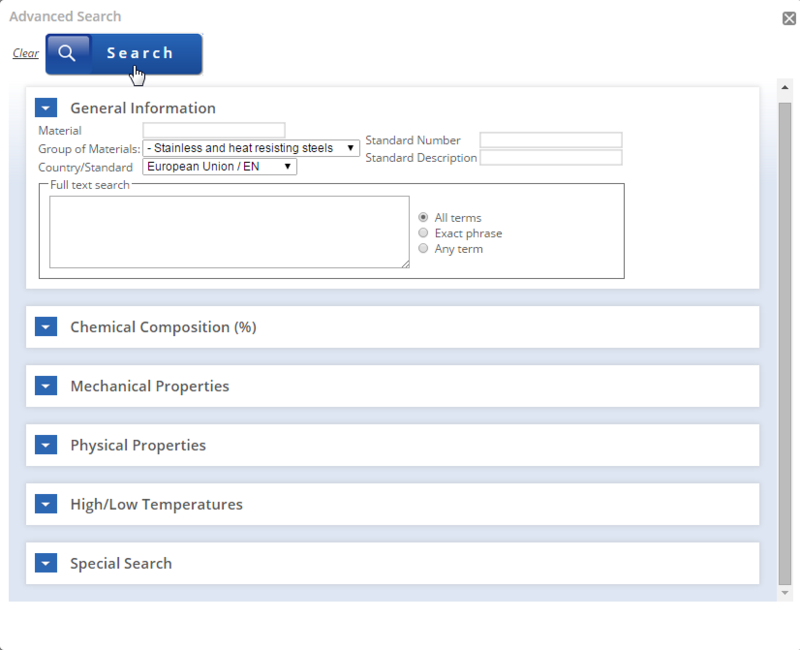 Other critical property data for stainless steels can also be viewed including mechanical properties data, physical properties, advanced property data and much more.